Sthembiso Dliwayo (also known as "Sprkz") is a South African hip hop dancer and television presenter best known for co-hosting the second season of the SABC1 documentary series Mi Kasi Su Kasi. 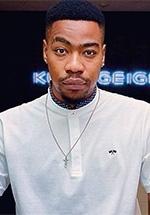 He is a member of The Reptilez dance crew, who won the Vuzu dance competition series Masters of Rhythm, in 2011. He hosted Kasi Vibes on Soweto TV before landing a presenting gig on the same channel's show Ziyamporoma, in 2016.